The Copyright Society of the USA established the Donald C. Brace Memorial Lecture over 40 years ago as an opportunity to invite a distinguished member of the copyright legal community to create a talk to be given and published in the Society’s journal. The list of annual Brace Lecture givers is a Who’s Who of the American copyright community. Last year’s lecture, which made it into the latest issue of the Journal of the Copyright Society, is well worth a read. It was given by Peter Menell, a professor at Berkeley Law School who co-directs the Berkeley Center for Law and Technology. It’s called This American Copyright Life: Reflections on Re-Equilibrating Copyright for the Internet Age. Since giving the lecture at Fordham Law School in NYC, Menell has been touring it (it has music and visual components) around various law schools and conferences. Two things about Menell’s talk/paper caught my attention. First was this sentence, early on in the paper, regarding his love for both copyright and technology during the outbreak of the Copyright Wars in the 2000s: “I was passionately in the middle, perhaps the loneliest place of all.” Second was his focus on the public reputation of copyright and how it needs to be rehabilitated. were inspired by content industry products. The situation could not be more different for adolescents, teenagers, college students, and netizens today. Many perceive copyright to be an overbearing constraint on creativity, freedom, and access to creative works.” (The latter category apparently includes Menell’s own kids.) In other words, copyright law has appeared in the public consciousness as a limiter of people’s behavior instead of as the force that enables creative works to be made. 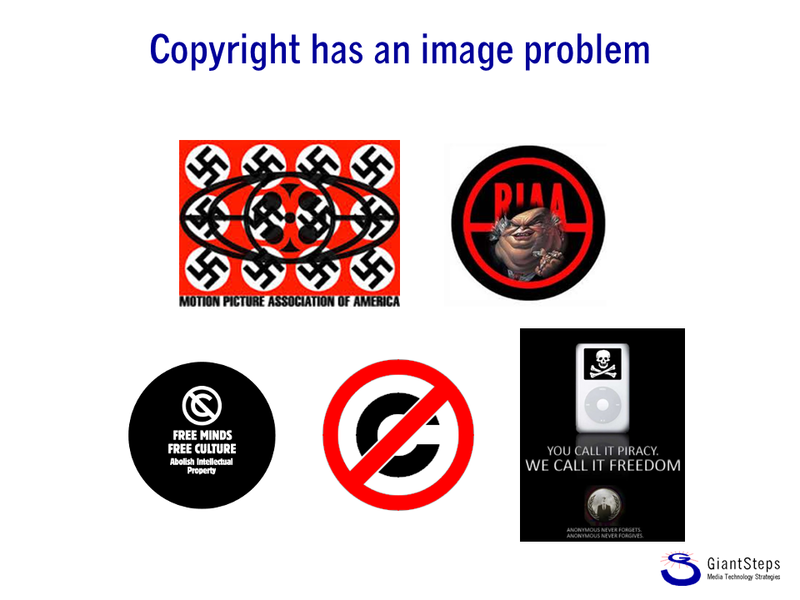 The icons in the figure refer respectively to the 1984 Universal v. Sony “Betamax” Supreme Court decision, the 2001 Ninth Circuit Napster decision, and the defeat of the Stop Online Piracy Act in 2012 from Silicon Valley-amplified public pressure. 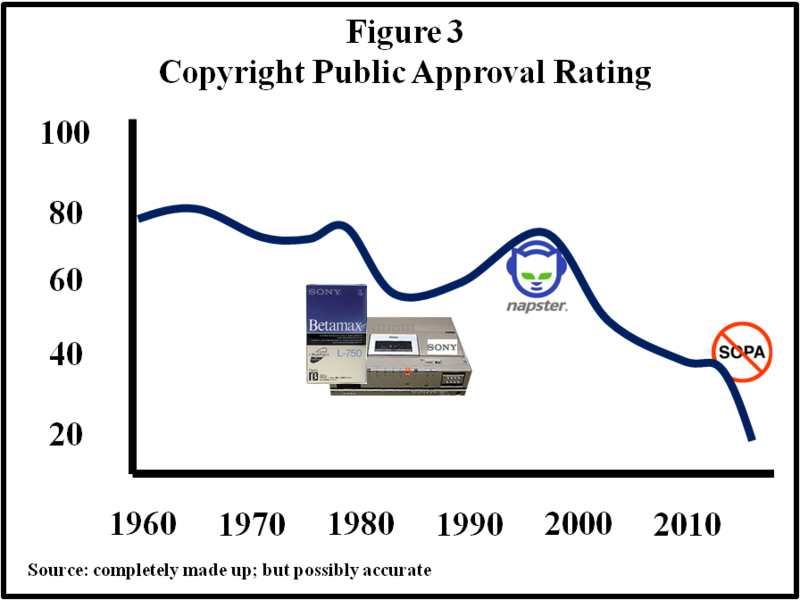 Menell provides a number of personal reflections about his engagement with technology and copyright over the years, including a story about how he and a friend created a slide show for their high school graduation ceremony with spliced-up music selections keyed to slide changes via a sync track on a reel-to-reel tape recorder. This combination of hack and mashup ought to establish Menell’s techie cred. In fact, the “live” version of the paper is itself a mashup of audio and video items. He takes the reader through the history of the dramatic shift in public attitudes towards copyright after the advent of Napster. My favorite part of this is a fascinating vignette of copyleft icon Fred von Lohmann, then of the Electronic Frontier Foundation (EFF), stating on a conference panel in 2002 that many users of peer-to-peer file-sharing networks were probably infringing copyrights and that the most appropriate legal strategy for the media industry ought to be to sue them, instead of suing the operators of P2P networks as the RIAA had done with Napster. Menell’s reaction, including his own incredulity at the time that “EFF did not use its considerable bully pulpit within the post-Napster generations to encourage ethical behavior as digital content channels emerged,” is just as fascinating. He also provides examples of the general online public’s current attitudes towards copyright, which has gone long past “Big Media is evil”; he says that “the post-Napster generations possess the incredible human capacity for rationalizing their self-interest” by their implications that individual content creators should not get paid because they are “lazy” or “old-fashioned” or even “spoiled” — even while he admits that the sixteen-year-old Peter Menell might have fallen prey to the same sad rationalizations. In the rest of the paper, Menell lays out a number of suggestions for how copyright law could change in order to make it more palatable to the public. These include what for me is the biggest breath of fresh air in the article: some of the only serious suggestions I’ve ever seen from copyright academics about using technology as an enabler of copyright rather than as its natural enemy. He touts the value of creating searchable databases of rights holder information and giving copyright owners the opportunity to deposit fingerprints of their content when they register their copyrights, in order to help prove and trace ownership. He also mentions encryption and DRM as means of controlling infringement that have succeeded in the video, software, and game industries, but he does not claim that they are or should be part of the legal system. One suggestion he makes along these lines is to establish a compulsory license, with relatively fixed royalties, for music used in remixes and mashups. That is, anyone who wants to use more than a tiny sample of music in a remix or mashup should pay a fee established by law (as opposed to by record labels or music publishers) that gets distributed to the appropriate rights holders. The idea is that such a scheme would strike a pragmatic and reasonable balance between rampant uncompensated use of content in remixes and unworkable (not to mention creativity-impeding) attempts to lock everything down. The U.S. Copyright Office would be tasked with figuring out suitable schemes for dividing up revenue from these licenses. It goes without saying that establishing any scheme of that type will involve years and years of lobbying and haggling to determine the rates. Even then, several factions aren’t likely to be interested in this idea in principle. Although musical artists surely would like to be compensated for the use of their material in remixes, many artists are not (or are no longer) in favor of more compulsory licenses and would rather see proper compensation develop in the free market. And the copyleft crowd tends to view all remixes and mashups as fair use, and therefore not subject to royalties at all. In general, Menell’s paper calls for changes to copyright law that are designed to improve its public image by making it seem more fair to both consumers and content creators. Changing behavioral norms in the online world is perhaps better done in narrowly targeted ways than broadly, but the paper ought to be a springboard for many more such ideas in the future. While there are certainly worthwhile aspects of the article, I’m afraid Prof. Menell is mistaken to the extent he suggests that I or EFF ever endorsed suing internet users as a solution to P2P file sharing. Anyone who knows me or EFF will recognize that assertion as absurd. Of course, I don’t doubt that what Prof. Menell (mis)heard that day influenced his thinking on copyright law. But to the extent he asserts that is what I believed or said that day, he’s wrong. There are plenty of contemporaneous records in other venues that corroborate this (as I’ve pointed out to Prof. Menell).